The year was 1977. The original Star Wars movie was released, and Jay Leno made his first appearance on The Tonight Show. E. Lee Trinkle Library was still a quiet place to study, and Anne Robinson Hallerman graduated from Mary Washington with a bachelor's degree in history. "I remember great road trips and fun parties," says Anne. "The school and classes were small enough so you knew your professors, and they knew you. This was especially true in the history department, where we had plenty of opportunities for sharing and debating ideas. All in all, it was a very positive experience." 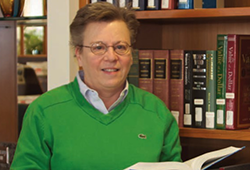 During her student years, Anne worked various campus jobs and was fortunate to spend two summers working at the Virginia State Library, now the Library of Virginia. "The position helped me earn money toward tuition, and I gained valuable experience working in the photograph and portrait collection," says Anne. After graduation, she began a permanent position at the Library. Anne put her Mary Washington degree to the test in 1986 when she became a winning contestant on the popular game show, Jeopardy! Just like Jeopardy! Anne's career as a librarian requires a broad liberal arts background and a keen interest in learning. In 1994, she received a master's degree in library science from Catholic University and began a position in the Research Library at the Federal Reserve Bank of Richmond. She now puts her two degrees to work as the Director of the Library, leading a team of five librarians. Their mission: to provide quality information resources, research, and consulting to help the Fed's leaders, policy makers, and employees make informed decisions. While time has faded a few pages in her 1977 yearbook, Anne's passion for Mary Washington grows brighter. She has been involved in the Alumni Board, she attends network events in Richmond, and she regularly participates in reunions. "I love reunions," she says. "They are so important in that – for a few brief hours – we can recapture a fun time of life and reconnect with people we used to know. I brought my partner, Jean, to the Class of 1977's 35th reunion so she could see why I love Mary Washington so much." Since graduation, Anne has made annual donations to Mary Washington. "My late husband and I both had soft spots for our alma maters; he supported his, while I supported Mary Washington. It's just the right thing to do." Anne became a member of the UMW Heritage Society when she added Mary Washington as a beneficiary of her life insurance. "Mary Washington has given me a lot through my life and career," she says. "I hope my future gift will help students who otherwise might not qualify for financial aid or be able to attend Mary Washington in any other way."